Well, a few weeks ago, I decided, enough thinking, it was time to sit and attempt to design this thing. And so the doodling started. After a lot of eraser marks, it started to take shape, on paper at least. Now, I have never designed a kite, especially not a 3D kite. The thoughts of will this thing actually work were running rampant, but in my mind, I was pretty certain I had it figured out, and so construction began. Basically I designed a box kite with an attached roof. The Snoopy image was found online. The frame is constructed with 3/16" dowels and covered with red plastic table cloth. Keep in mind that this is just a prototype to see if it would work. If the design proved worthy, then I would build it out of nice rip stop nylon. The corners are joined with plastic drinking straws, a method I also found online. Snoopy himself is 2 pieces of white plastic glued together on the edges with 2 dowels and a loop of weed eater line to help him hold his shape. He is attached to the roof with a few small tabs if Velcro. 2 well placed holes in the roof help filter air into his body for added support. Construction was done and it was time for the initial test flight. I attached the line in the center of the "X" and the roof point. The wind picked up and there it went, only to tip and nose dive into the ground, breaking one of my dowels. After replacing the broken dowel, I did some more brainstorming. I was now confident that if I could bridle this thing correctly, it would work. I decided to try a 5 point bridle, testing and measuring in an attempt to get the angles right, all while sitting on my kitchen table. My wife, of course, thought I was becoming obsessed. I was going to get it right, one way or another. Time for the 2nd test flight, this time, success! The wind picked up to around 8 mph., and, up he went, this time flying as he should. There is nothing like the feeling of designing something and seeing it work for the first time, no matter how complex or simple that thing might be. The wind let up and again the roof tipped down, but this time, as the wind picked back up, he righted himself and flew as he should. As he came back down, I waited for the wind to pick back up again. This time I held him upside down to see what it would do. The wind took the dog house and he flipped right side up and away he flew! Success! I just made a trip to the fabric store to get my rip stop nylon. Now to get cutting. Red Baron, look out! Comments for Red Baron ..Look Out! Here is a link of our kite festival with Snoopy doing his thing. Thanks for reporting on all that effort and persistence here. 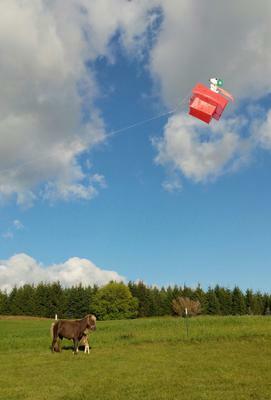 A home-made kite that flies well is always gratifying. Even more in your case, since you didn't start with a proven design!